Optimize data center management and performance for IT systems and data centers. Emerson Network Power delivers data center racks, server rack cabinets, and enclosure solutions, from Knürr and Liebert. 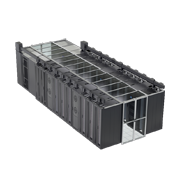 Data Center rack solutions support IT and networking equipment in computer rooms of all sizes, with rack enclosures that contain precision cooling, uninterruptible power, rack PDUs, and wiring management in a sturdy, lockable cabinet. Liebert products, solutions and services from Emerson Network Power optimize data center infrastructure through cooling and monitoring technologies.